Based in suburban Minneapolis, Minnesota, Medtronic is the world’s largest medical technology and a Fortune 500 company. Medtronic develops and manufactures innovative medical device technology and therapies to treat chronic disease worldwide. It’s six major businesses focuses around a condition or therapy type: Cardiac Rhythm Disease Management, Spinal and Biologics, CardioVascular, Neuromodulation, Diabetes, and Surgical Technologies. Avalere Health is an advisory services company whose core purpose is to create innovative solutions to complex healthcare problems. Based in Washington DC, the firm delivers research, analysis, insight, and strategy for leaders in healthcare business and policy to Fortune 500 healthcare companies, top consultancies, and nonprofits. Avalere’s consulting services have provided Medtronic expertise across a few vertical of healthcare policy. One of the areas of consulting was geared towards creating efficiency within the Neuromodulation team at Medtronic. Avalere needed a technical partner to work with their consultants and Medtronic to develop a mechanism that improved communication and data management between the Neuromodulation team. In 2008, HindSite Interactive was selected as the web development and consulting company to provide the technical expertise needed to develop a web application that fulfilled client’s requirements. 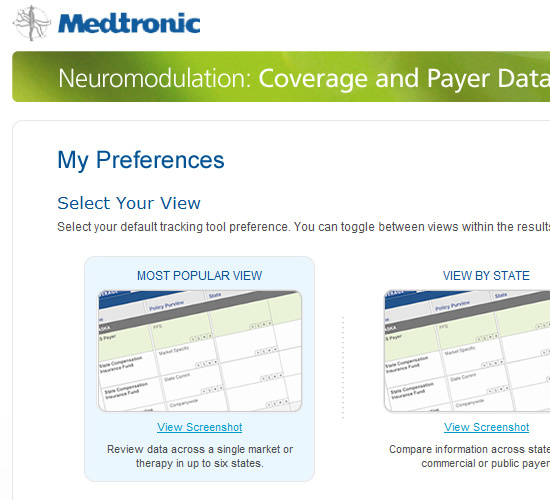 The Neuromodulation database was composed of over 3,000 payers across 15 Jurisdictions and there was no out of the box solution that allowed proper communication and collaboration between the Medtronic members most of whom resided in different locations and were used to communicating updates through outdated excel files via back and forth email communication. The transfer of revised updates within multiple excel documents between a entire team located at different locations was proving difficult and highly inefficient. The solution called for an easy web based application that allowed teams to privately communicate internally and keep track of whom revised and appended updates at any given time. 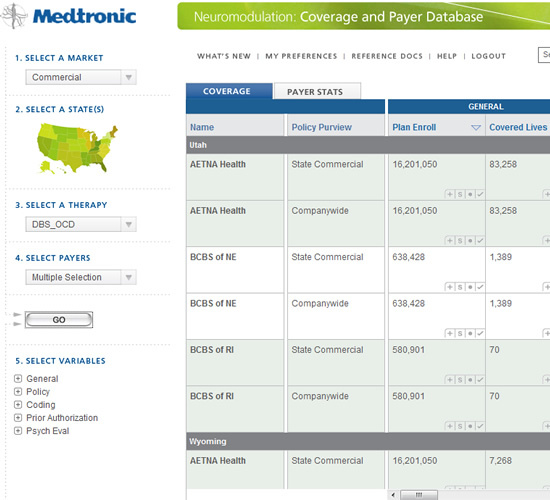 The Neuromodulation database was composed of over 3,000 payers across 15 Jurisdictions. 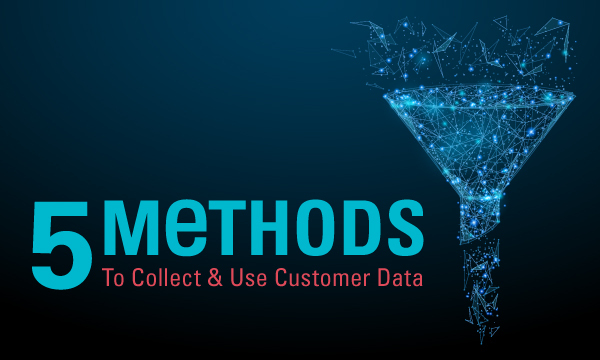 There was no out of the box solution or web application that provided the editing, moderation and management of data needed by the Medtronic Team. The solution called for a web application that was fully custom designed to fit the needs of the Medtronic team and provided centralization of data management for the Neuromodulation team. The application was built from the ground up utilizing a PHP/MySQL, JQuery, and Ajax to allow for quick data load and rendering. A multi-level moderation and administrative system allowed for editor and user permissions to full manage the application. – Filter and query data via State, Jurisdiction, Device, and over 100 other variables. – Scheduled push notifications allowed designated members to get up to date information of recent payer updates. 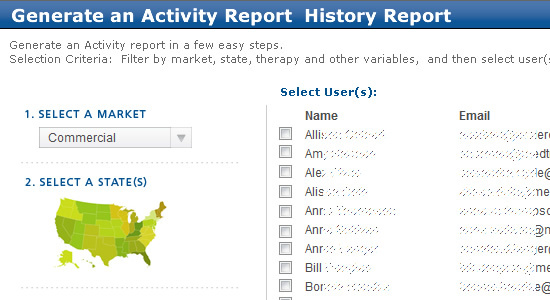 – Tracking and logs allows top level admin(s) to oversee user activity and history. – Allow users to easily generate custom reports to print or download as Excel and PDF format. 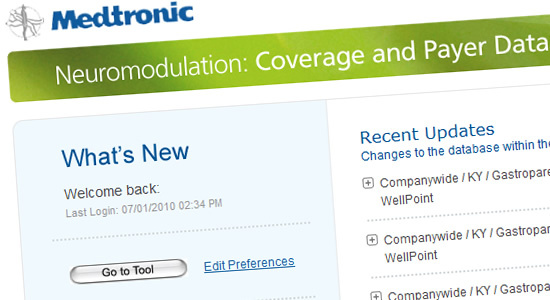 The Neuromodulation web application increased efficiency between Medtronic staff managing Payer and Device related content. 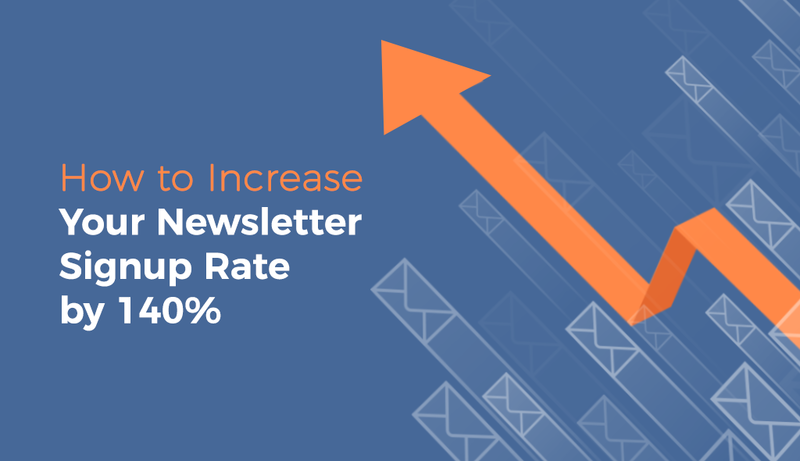 The frequency of email attachments of hard to track updates within MS Excel documents was close to eliminated and instead replaced with automated email push notifications that provided updates and changes associated with attending staff managing each device or payer jurisdiction.